Railpictures.ca - Bill Thomson Photo: CP RDC-2 9109 and a 90xx-series RDC-1 are seen passing the platforms at CP’s Westmount Station in Montreal QC. CP 9109 was built in 1955 by Budd as an RDC-2 (passenger seating with a small baggage area), later rebuilt into an “RDC-5″ by CP in the mid-70′s (RDC-5 was CP’s term for an RDC-2 converted into RDC-1 with the baggage section removed and more seating), and was sold to VIA in 1978 to became VIA 6138. It was eventually retired by VIA and sold to Farmrail in 1999, and languished at VIA’s Toronto Maintenance Centre where it remains to this day. | Railpictures.ca – Canadian Railway Photography – photographie ferroviaire Canadienne. Caption: CP RDC-2 9109 and a 90xx-series RDC-1 are seen passing the platforms at CP's Westmount Station in Montreal QC. 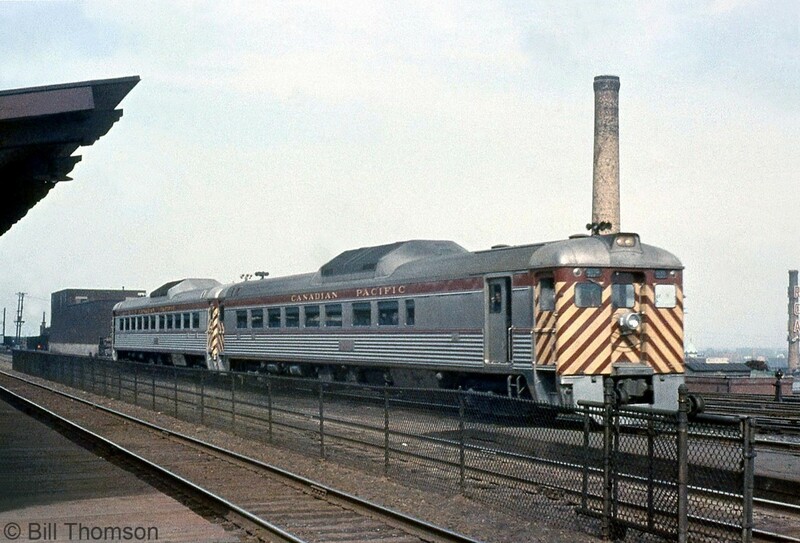 CP 9109 was built in 1955 by Budd as an RDC-2 (passenger seating with a small baggage area), later rebuilt into an "RDC-5" by CP in the mid-70's (RDC-5 was CP's term for an RDC-2 converted into RDC-1 with the baggage section removed and more seating), and was sold to VIA in 1978 to become VIA 6138. It was eventually retired by VIA and sold to Farmrail in 1999, but has languished unused at VIA's Toronto Maintenance Centre where it remains to this day. Very nice…the best RDC scheme ever! Did you happen to turn to the right and shoot anything in the coach yard? Awesome…. Of interest is the smokestack at right with ‘RCA’ on it, part of the RCA building that produced records at the time.